Robert, Keith. Pavane . Ace 1968. Roberts, Keith. Pavane . 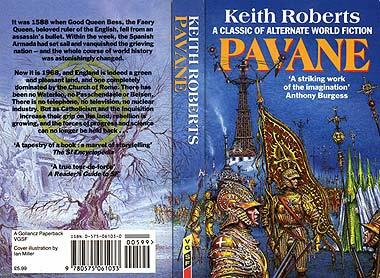 Gollancz 1995. 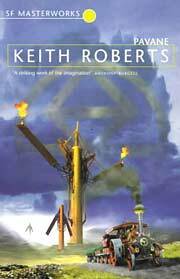 Roberts, Keith. Pavane . Millennium 2000. What if: Elizabeth I was assassinated, the Armada triumphed, and Europe and the New World languished under 400 years of being ruled by the Roman Catholic church. Comments: Collection of "The Lady Margaret", "The Signaller", "The White Boat", "Brother John", "Lords and Ladies", "Corfe Gate", and "Coda". The 1968 Hart-Davis and 1970 Panther editions do not include "The White Boat", and "Coda" may not appear in some early editions. Published: Hart-Davis 1968; Doubleday 1968; Ace 1968 (0441654304); Panther 1970; Berkley 1976; Gollancz 1984 (0575034378); Penguin 1988 (0140105646); Gollancz 1995 (0575061030); Millennium 2000 (1857989376w88 android); Ballantine/Del Rey 2001 (0345440919BUY). Translation: Nederlands by Henk van Slangenburg as Dodendans met het Roomse Rijk , Born 1972 (9028302816). Translation: French by Frank Straschitz and Dominique Defert as Pavane , Opta 1971, Livre de poche 1978 (225301866X). Translation: German by Thomas Schluck as Die folgenschwere Ermordung ihrer Majestät Elisabeth I. , Heyne 1977, 1981 (3453303938), v.t. Pavane , Heyne 1984. Translation: Italian by Guido Zurlino as Pavana , Mondadori 1989. Translation: Portuguese by Trindade Santos as Pavana , Clássica 1992. Translation: Spanish by Jaime Riera Salvador as Pavana , Minotauro ..., Ultramar 1987 (847386459X). Translation: Spanish by Matilde Horne as Pavana , Minotauro 2000 (844507329X, 8445073265). Summary: The tale of a "haulier", the driver of a steam-powered road locomotive, making one last run before the onset of winter closes the roads for the season. Series note: First story in Pavane . Published: As "The Lady Anne", in Impulse , April 1966. Published: As "The Lady Margaret", in Pavane , q.v. ; A Day in the Life: A Science Fiction Anthology (ed. Gardner Dozois), Harper & Row 1972 (0060110767); Alternative Histories: Eleven Stories of the World as It Might Have Been (eds. Charles G. Waugh and Martin H. Greenberg), q.v. ; and The Legend Book of Science Fiction (ed. Gardner Dozois), Legend 1991 (0712650105, 0712648615), v.t. Modern Classics of Science Fiction , St. Martin's 1992 (0312072384BUY), 1993 (0312088477BUY). Summary: A farmboy attains a position in the Guild of Signallers, attends the guild school, and is assigned to his first posts. But much is demanded of the heroic signallers, and this guildsman is given a winter posting to an isolated Class D semaphore tower. Series note: Second story in Pavane . Published: In Impulse , March 1966; Pavane , q.v. ; Another World: A Science Fiction Anthology (ed. Gardner Dozois), Follett 1977 (0695806955); and The Best of British SF 2 (ed. Mike Ashley), Futura 1977 (0860079139). Roberts, Keith. "The White Boat"
Series note: Third story in Pavane . Published: In New Worlds , December 1966; Pavane , q.v. ; The Grain Kings , Hutchinson 1976 (0091234905); and The Passing of the Dragons , Berkley/Medallion 1976 (0425034771). Summary: In 1985, a priest with an artistic bent is assigned to chronicle the activities of the Office of Spiritual Welfare — the Inquisition. 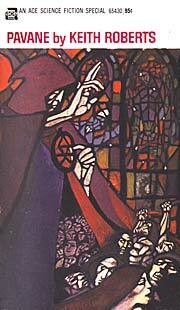 Driven nearly insane he flees the church, and his teachings lead to uprisings against Rome throughout Britain. Series note: Fourth story in Pavane . Published: In Impulse , May 1966; and Pavane , q.v. Roberts, Keith. "Lords and Ladies"
Summary: A young woman reflects on her uncle's drive to dominate the hauliage business in the southwest of Britain, and on how she became involved with the heir to the demesne of Corfe Gate. Series note: Fifth story in Pavane . Published: In Impulse , June 1966; and Pavane , q.v. Summary: Realizing it would cause starvation in her own lands, the Lady Eleanor of Corfe Gate refuses to pay a church tax to alleviate famine in France, thereby provoking the War of the Castles, a general British revolt against Roman rule. Series note: Sixth story in Pavane . Published: In Impulse , July 1966; and Pavane , q.v. Summary: An epilog which reveals that although the events of "Corfe Gate" did not all turn out well, the War of the Castles eventually led to the loss of Roman control over Britain and the Americas. Series note: Seventh story in Pavane . Published: In Pavane , q.v.